The generic name Thespesia is derived from the Greek thespesios, divine, referring to T. populnea, which was collected in Tahiti by Captain Cook’s expedition in 1769 and was reported to be a sacred tree and planted around places of worship. The specific epithet populnea, poplar-like, likely in reference to the leaves resembling some poplar (Populus spp.) tree species. Milo means to twist, curl, or spin. This name is also used in the Marshall Islands and American Samoa. This is probably an indigenous tree. However, to date, there is no conclusive evidence to support milo as indigenous. [6,12,14] Even so, milo is also one of the canoe plants that the Polynesians brought with them to the islands, and certainly not invasive as its non-native cousin hau (Hibiscus tiliaceus), also brought in by the early settlers. The fruits and seeds are salt tolerant and are distributed island to island by sea. The seeds will germinate even after a year in seawater. Even though the flowers and young leaves are reported to be mildly poisonous, milo is one of the few plants that were listed as an emergency food during World War II in a manual called “Emergency Food Plants and Poisonous Plants of the Islands of the Pacific” by the War Department. It states that “the purpose of this manual is to aid the individual who becomes separated from his unit…so that this individual can live off the land.” It then briefly identifies the plant and how to prepare it. The beautiful wood was prized by early Hawaiians second only to kou, to make food bowls (ʻumeke milo), poi calabashes, platters (pā milo), and dishes because the wood gave no unpleasant taste to the food like some other native woods, such as koa. The bark was used as cordage. The fruits produce a yellowish green dye, medicine, oil, and gum. The yellow flowers were used by lei makers. 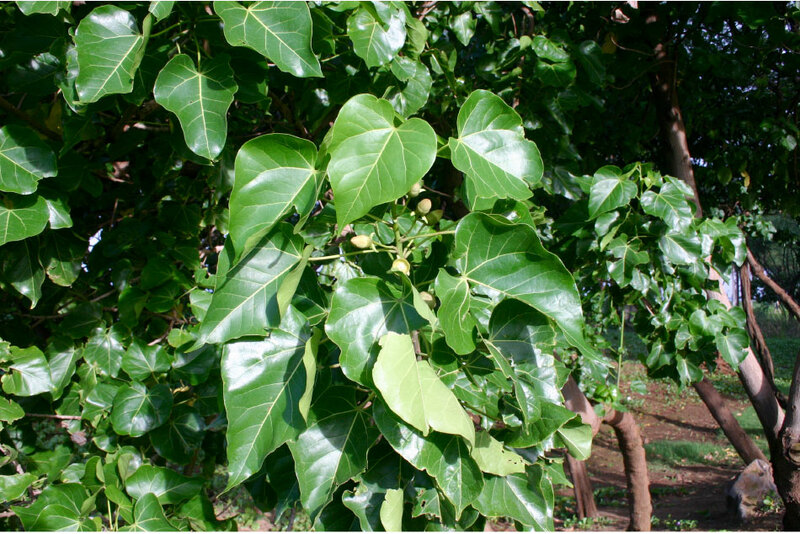 Early Hawaiians found young milo leaves, flowers, and flower buds to be edible. Milo was considered a sacred tree and the use prohibited by commoners. The house of King Kamehameha I in Waikīkī was surrounded by milo. Today, the seeds are sometimes strung for permanent lei. The dark heartwood is moderately heavy, easy to work with, has a low shrinkage in drying and is durable. The wood has been fashioned into beautiful items such as carvings, bowls and platters. Milo is also used in boatbuilding and in cabinet making. In Hawaiʻi and elsewhere in the tropics, milo is sometimes used as street or park trees, or as a living fence.